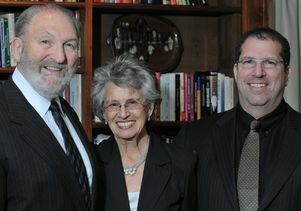 Ralph, Shirley and Peter Shapiro, whose family foundation has long supported UCLA faculty and programs dedicated to improving care for people with disabilities. The David Geffen School of Medicine at UCLA has received $2.257 million from Ralph, Shirley, Peter and Alison Shapiro to support four endowed chairs in the department of pediatrics. The chairs will help UCLA recruit and retain faculty in pediatrics who are focused on enhancing quality of life for children with cerebral palsy, autism, and other developmental and behavioral challenges. The gift bolsters support for an endowed chair the Shapiros established earlier, and it will create three new additional term chairs that will benefit faculty for five-year terms. The original Shapiro Family Term Chair in Developmental and Behavioral Pediatrics and Cerebral Palsy, currently held by assistant clinical professor Dr. Irene Koolwijk, helps strengthen training. The Peter Shapiro Term Chair for Enhancing Children's Developmental and Behavioral Health will support faculty in training health care providers, creating curricula and developmental screening tools, and leading national and international initiatives. The gift also will advance clinical care through the Alison Shapiro Term Chair for Children's Cognitive Development and support research through the Ronald and Susan Cohen Term Chair in Childhood Development and Cerebral Palsy. The latter was funded through a partnership between the Shapiros and United Cerebral Palsy of Los Angeles to honor Ronald Cohen, who is retiring after more than 30 years as UCPLA’s president and CEO. "UCLA is proud to continue collaborating with the Shapiro family to accelerate innovation in children's health and improve the lives of children with developmental and behavioral challenges," said Dr. Sherin Devaskar, Mattel Executive Endowed Chair of the department of pediatrics at the Geffen School of Medicine and physician-in-chief of UCLA Mattel Children’s Hospital. "The endowed chairs the Shapiros have funded will enable UCLA to recruit and retain faculty in the field, and they are testaments to the Shapiro family's philanthropic leadership in providing enhanced care and services for individuals with disabilities." The chairs complement each other and extend the Shapiros' long-standing commitment to improve care for people with disabilities. The Shirley and Ralph Shapiro Fellowship Fund provides for first-year fellows in developmental–behavioral pediatrics. The family also has established endowments at the UCLA School of Dentistry, UCLA School of Nursing, and department of orthopaedic surgery to promote the well-being of people with developmental disabilities throughout their lives. "Society has a responsibility to care for the most vulnerable individuals and families," said Peter Shapiro, president of the Shapiro Family Charitable Foundation, which he founded with his parents, Ralph and Shirley, and his sister Alison. "Our partnership with UCLA empowers faculty and students with the knowledge to meet that need." Ralph Shapiro was a longtime member of the UCLA Foundation board of directors and has served on many other UCLA advisory councils. He earned his bachelor's degree in business administration in 1953 and his law degree in 1958, both from UCLA. His wife, Shirley, who received her bachelor's degree from UCLA in 1959, serves on the boards of UCLA Women and Philanthropy, the UCLA School of the Arts and Architecture and the Fowler Museum at UCLA. The Shapiros' latest gift is part of the $4.2 billion UCLA Centennial Campaign, which is scheduled to conclude in December 2019 during UCLA's 100th anniversary year.